"James Frazer" redirects here. For others, see James Frazer (disambiguation). 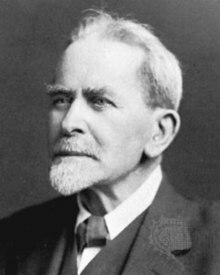 Sir James George Frazer OM FRS FRSE FBA (/ˈfreɪzər/; 1 January 1854 – 7 May 1941) was a Scottish social anthropologist and folklorist influential in the early stages of the modern studies of mythology and comparative religion. His most famous work, The Golden Bough (1890), documents and details the similarities among magical and religious beliefs around the globe. Frazer posited that human belief progressed through three stages: primitive magic, replaced by religion, in turn replaced by science. He was born on 1 January 1854 in Glasgow, Scotland, the son of Daniel F. Frazer, a chemist, and his wife, Katherine Brown. Frazer attended school at Springfield Academy and Larchfield Academy in Helensburgh. He studied at the University of Glasgow and Trinity College, Cambridge, where he graduated with honours in classics (his dissertation was published years later as The Growth of Plato's Ideal Theory) and remained a Classics Fellow all his life. From Trinity, he went on to study law at the Middle Temple, but never practised. Four times elected to Trinity's Title Alpha Fellowship, he was associated with the college for most of his life, except for a year, 1907–1908, spent at the University of Liverpool. He was knighted in 1914, and a public lectureship in social anthropology at the universities of Cambridge, Oxford, Glasgow and Liverpool was established in his honour in 1921. He was, if not blind, then severely visually impaired from 1930 on. He and his wife, Lilly, died in Cambridge, England, within a few hours of each other. He died on 7 May 1941. They are buried at the Ascension Parish Burial Ground in Cambridge. His sister Isabella Katherine Frazer married the mathematician John Steggall. Frazer is commonly interpreted as an atheist in light of his criticism of Christianity and especially Roman Catholicism in The Golden Bough. However, his later writings and unpublished materials suggest an ambivalent relationship with Neoplatonism and Hermeticism. The study of myth and religion became his areas of expertise. Except for visits to Italy and Greece, Frazer was not widely travelled. His prime sources of data were ancient histories and questionnaires mailed to missionaries and imperial officials all over the globe. Frazer's interest in social anthropology was aroused by reading E. B. Tylor's Primitive Culture (1871) and encouraged by his friend, the biblical scholar William Robertson Smith, who was comparing elements of the Old Testament with early Hebrew folklore. The first edition, in two volumes, was published in 1890; and a second, in three volumes, in 1900. The third edition was finished in 1915 and ran to twelve volumes, with a supplemental thirteenth volume added in 1936. He published a single-volume abridged version, largely compiled by his wife Lady Frazer, in 1922, with some controversial material on Christianity excluded from the text. The work's influence extended well beyond the conventional bounds of academia, inspiring the new work of psychologists and psychiatrists. Sigmund Freud cited Totemism and Exogamy frequently in his own Totem and Taboo: Resemblances Between the Psychic Lives of Savages and Neurotics. The symbolic cycle of life, death and rebirth which Frazer divined behind myths of many peoples captivated a generation of artists and poets. Perhaps the most notable product of this fascination is T. S. Eliot's poem The Waste Land (1922). Frazer's pioneering work has been criticised by late 20th-century scholars. For instance, in the 1980s Edmund Leach wrote a series of critical articles, one of which was featured as the lead in Anthropology Today, vol. 1 (1985). He criticised The Golden Bough for the breadth of comparisons drawn from widely separated cultures, but often based his comments on the abridged edition, which omits the supportive archaeological details. In a positive review of a book narrowly focused on the cultus in the Hittite city of Nerik, J. D. Hawkins remarked approvingly in 1973, "The whole work is very methodical and sticks closely to the fully quoted documentary evidence in a way that would have been unfamiliar to the late Sir James Frazer." More recently, The Golden Bough has been criticized for what are widely perceived as imperialist, anti-Catholic, classist and racist elements, including Frazer's assumptions that European peasants, Aboriginal Australians and Africans represented fossilized, earlier stages of cultural evolution. Another important work by Frazer is his six-volume commentary on the Greek traveller Pausanias' description of Greece in the mid-2nd century AD. Since his time, archaeological excavations have added enormously to the knowledge of ancient Greece, but scholars still find much of value in his detailed historical and topographical discussions of different sites, and his eyewitness accounts of Greece at the end of the 19th century. Among the most influential elements of the third edition of The Golden Bough is Frazer's theory of cultural evolution and the place Frazer assigns religion and magic in that theory. Frazer's theory of cultural evolution was not absolute and could reverse, but sought to broadly describe three (or possibly, four) spheres through which cultures were thought to pass over time. Frazer believed that, over time, culture passed through three stages, moving from magic, to religion, to science. Frazer's classification notably diverged from earlier anthropological descriptions of cultural evolution, including that of Auguste Comte, because he claimed magic was both initially separate from religion and invariably preceded religion. He also defined magic separately from belief in the supernatural and superstition, presenting an ultimately ambivalent view of its place in culture. Frazer believed that magic and science were similar because both shared an emphasis on experimentation and practicality; indeed, his emphasis on this relationship is so broad that almost any disproven scientific hypothesis technically constitutes magic under his system. In contrast to both magic and science, Frazer defined religion in terms of belief in personal, supernatural forces and attempts to appease them. As historian of religion Jason Josephson-Storm describes Frazer's views, Frazer saw religion as "a momentary aberration in the grand trajectory of human thought." He thus ultimately proposed – and attempted to further – a narrative of secularization and one of the first social-scientific expressions of a disenchantment narrative. At the same time, Frazer was aware that both magic and religion could persist or return. He noted that magic sometimes returned so as to become science, such as when alchemy underwent a revival in Early Modern Europe and became chemistry. On the other hand, Frazer displayed a deep anxiety about the potential of widespread belief in magic to empower the masses, indicating fears of and biases against lower-class people in his thought. This type of story is common in Africa. Two messages are carried from the supreme being to mankind: one of eternal life and one of death. The messenger carrying the tidings of eternal life is delayed, and so the message of death is received first by mankind. The Bantu people of Southern Africa, such as the Zulu, tell that Unkulunkulu, the Old Old One, sent a message that men should not die, giving it to the chameleon. The chameleon was slow and dawdled, taking time to eat and sleep. Unkulunkulu meanwhile had changed his mind and gave a message of death to the lizard who travelled quickly and so overtook the chameleon. The message of death was delivered first and so, when the chameleon arrived with its message of life, mankind would not hear it and so is fated to die. Because of this, Bantu people, such as the Ngoni, punish lizards and chameleons. For example, children may be allowed to put tobacco into a chameleon's mouth so that the nicotine poisons it and the creature dies, writhing while turning colours. Variations of the tale are found in other parts of Africa. The Akamba say the messengers are the chameleon and the thrush while the Ashanti say they are the goat and the sheep. The Bura people of northern Nigeria say that, at first, neither death nor disease existed but, one day, a man became ill and died. The people sent a worm to ask the sky deity, Hyel, what they should do with him. The worm was told that the people should hang the corpse in the fork of a tree and throw mush at it until it came back to life. But a malicious lizard, Agadzagadza, hurried ahead of the worm and told the people to dig a grave, wrap the corpse in cloth, and bury it. The people did this. When the worm arrived and said that they should dig up the corpse, place it in a tree, and throw mush at it, they were too lazy to do this, and so death remained on Earth. This Bura story has the common mythic motif of a vital message which is diverted by a trickster. In Togoland, the messengers were the dog and the frog, and, as in the Bura version, the messengers go first from mankind to God to get answers to their questions. The moon regularly seems to disappear and then return. This gave primitive peoples the idea that man should or might return from death in a similar way. Stories that associate the moon with the origin of death are found especially around the Pacific region. In Fiji, it is said that the moon suggested that mankind should return as he did. But the rat god, Ra Kalavo, would not permit this, insisting that men should die like rats. In Australia, the Wotjobaluk aborigines say that the moon used to revive the dead until an old man said that this should stop. The Cham have it that the goddess of good luck used to revive the dead, but the sky-god sent her to the moon so she could not do this any more. Animals which shed their skin, such as snakes and lizards, appeared to be immortal to primitive people. This led to stories in which mankind lost the ability to do this. For example, in Vietnam, it was said that the Jade Emperor sent word from heaven to mankind that, when they became old, they should shed their skins while the serpents would die and be buried. But some snakes overheard the command and threatened to bite the messenger unless he switched the message, so that man would die while snakes would be eternally renewed. For the natives of the island of Nias, the story was that the messenger who completed their creation failed to fast and ate bananas rather than crabs. If he had eaten the latter, then mankind would have shed their skins like crabs and so lived eternally. The banana plant bears its fruit on a stalk which dies after bearing. This gave people such as the Nias islanders the idea that they had inherited this short-lived property of the banana rather than the immortality of the crab. The natives of Poso also based their myth on this property of the banana. Their story is that the creator in the sky would lower gifts to mankind on a rope and, one day, a stone was offered to the first couple. They refused the gift as they did not know what to do with it and so the creator took it back and lowered a banana. The couple ate this with relish, but the creator told them that they would live as the banana, perishing after having children rather than remaining everlasting like the stone. According to historian Timothy Larsen, Frazer used scientific terminology and analogies to describe ritual practices, and conflated magic and science together, such as describing the "magic wand of science". Larsen criticizes Frazer for baldly characterized magical rituals as "infallible" without clarifying that this is merely what believers in the rituals thought. Larsen has said that Frazer's vivid descriptions of magical practices were written with the intention to repel readers, but, instead, these descriptions more often allured them. Larsen also criticizes Frazer for applying western European Christian ideas, theology, and terminology to non-Christian cultures. This distorts those cultures to make them appear more Christian. Frazer routinely described non-Christian religious figures by equating them with Christian ones. Frazer applied Christian terms to functionaries, for instance calling the elders of the Njamus of East Africa "equivalent to the Levites of Israel" and the Grand Lama of Lhasa "the Buddhist Pope... the man-god who bore his people's sorrows, the Good Shepherd who laid down his life for the sheep". He routinely uses the specifically Christian theological terms "born again", "new birth", "baptism", "christening", "sacrament", and "unclean" in reference to non-Christian cultures. When Frazer's Australian colleague Walter Baldwin Spencer requested to use native terminology to describe Aboriginal Australian cultures, arguing that doing so would be more accurate, since the Christian terms were loaded with Christian connotations that would be completely foreign to members of the cultures he was describing, Frazer insisted that he should use Judeo-Christian terms instead, telling him that using native terms would be off-putting and would seem pedantic. A year later, Frazer excoriated Spencer for refusing to equate the non-estrangement of Aboriginal Australian totems with the Christian doctrine of reconciliation. When Spencer, who had studied the aboriginals firsthand, objected that the ideas were not remotely similar, Frazer insisted that they were exactly equivalent. Based on these exchanges, Larsen concludes that Frazer's deliberate use of Judeo-Christian terminology in the place of native terminology was not to make native cultures seem less strange, but rather to make Christianity seem more strange and barbaric. Description of Greece, by Pausanias (translation and commentary) (1897–) 6 volumes. ^ a b Fleure, H. J. (1941). "James George Frazer. 1854-1941". Obituary Notices of Fellows of the Royal Society. 3 (10): 896–914. doi:10.1098/rsbm.1941.0041. ^ Josephson-Storm, Jason (2017). "Chapter 6: The Revival of Magick: Aleister Crowley". The Myth of Disenchantment: Magic, Modernity, and the Birth of the Human Sciences. University of Chicago Press. ISBN 0-226-40336-X. ^ Josephson-Storm (2017), Chapter 5. ^ Mary Beard, "Frazer, Leach, and Virgil: The Popularity (and Unpopularity) of the Golden Bough," Comparative Studies in Society and History, 34.2 (April 1992:203–224). ^ "Frazer, James George (FRSR874JG)". A Cambridge Alumni Database. University of Cambridge. ^ Address to Sir James George Frazer on the occasion of the foundation, in his honour, of the Frazer Lectureship in Social Anthropology in the Universities of Oxford, Cambridge, Glasgow and Liverpool (1920). ^ For the history of The Golden Bough see R. Fraser, The Making of The Golden Bough: The Origins and Growth of an Argument (London, 1990). ^ "For those who see Frazer's work as the start of anthropological study in its modern sense, the site and the cult of Nemi must hold a particular place: This colourful but minor backwater of Roman religion marks the source of the discipline of Social anthropology", remarks Mary Beard, in noting the critical reassessment of Frazer's work following Edmund Leach, "Frazer, Leach, and Virgil: The Popularity (and Unpopularity) of the Golden Bough," Comparative Studies in Society and History, 34.2 (April 1992:203–224), p. 204. ^ Hawkins, reviewing Volkert Haas, Der Kult von Nerik: ein Beitrag zur hethitischen Religionsgeschichte, in Bulletin of the School of Oriental and African Studies, University of London 36.1 (1973:128). ^ Chidester (2014), pp. x–xi, 5, 8; and Chapter 6. ^ Carneiro, Robert L. (2003). Evolutionism in Cultural Anthropology: A Critical History. University of Chicago Press. p. 29. ISBN 0429980302. ^ On the possibility of a fourth stage see Josephson-Storm (2017), pp. 146–147. ^ Chidester (2014), p. 159. ^ Josephson-Storm (2017), pp. 141–142. ^ Josephson-Storm (2017), pp. 142–143. ^ Malinowski (2014), n. pag. ^ Josephson-Storm (2017), p. 145. ^ Josephson-Storm (2017), pp. 145–147. ^ Arthur Cotterell (1999), "Death comes into the world", Encyclopedia of World Mythology, ISBN 978-0-7607-2855-0, Long ago, there was no such thing as death. All were therefore surprised when a man died. They sent a worm to the sky to ask Hyel, the supreme deity (Bura, Pabir/Nigeria), what they should do. ^ Scheub, Harold (1990), The African storyteller: stories from African oral traditions, Kendall/Hunt Publishing Company, p. 52, ISBN 978-0-8403-6037-3, the Bura people [...] had an unusually full system of culture embedded in their folk tales. ^ Scheub, Harold (1994), Meanings: Manual for the African Storyteller, Kendall/Hunt, p. 27, ISBN 978-0-8403-9934-2, The motif is a venerable mythic motif, the interrupted message, and raises the question of what would have happened if only, if only . . . A worm, in this incarnation of the motif, is to inform the humans that life is everlasting. But a trickster of a lizard overtakes the worm, and gives the wrong message: humans are evanescent. So it is that death comes permanently into the world. And the storyteller adds a scene in which the onus for death is placed entirely on the backs of humans: people are too lazy to retrieve the corpse and hang it on a tree. ^ Larsen 2014, pp. 43–44. ^ Larsen 2014, p. 44. ^ Larsen 2014, p. 46. ^ Larsen 2014, pp. 46–48. ^ a b c d e Larsen 2014, p. 47. ^ Larsen 2014, pp. 47–48. ^ a b Larsen 2014, p. 48. Ackerman, Robert (1987). J. G. Frazer: His Life and Work. Cambridge University Press. ISBN 0521340934. Ackerman, Robert (2002). The Myth & Ritual School: J. G. Frazer and the Cambridge Ritualists. New York: Routledge. ISBN 1135371121. Chidester, David (2014). Empire of Religion: Imperialism & Comparative Religion. Chicago: University of Chicago Press. ISBN 022611757X. Fraser, Robert (1990). The Making of "The Golden Bough". New York: St. Martin's Press. ISBN 1349207209. Josephson-Storm, Jason (2017). "Chapter 5: The Decline of Magic: J.G. Frazer". The Myth of Disenchantment: Magic, Modernity, and the Birth of the Human Sciences. University of Chicago Press. ISBN 0-226-40336-X. Malinowski, Bronislaw (2014). Magic, Science and Religion and Other Essays. Read Books. ISBN 1473393124. Wikisource has the text of a 1922 Encyclopædia Britannica article about James George Frazer.